This is why my recent success means so much to me; I managed to win the mental fight and crossed the finish line, knowing that I gave all I had on that day! First up - Tell us a bit about yourself. 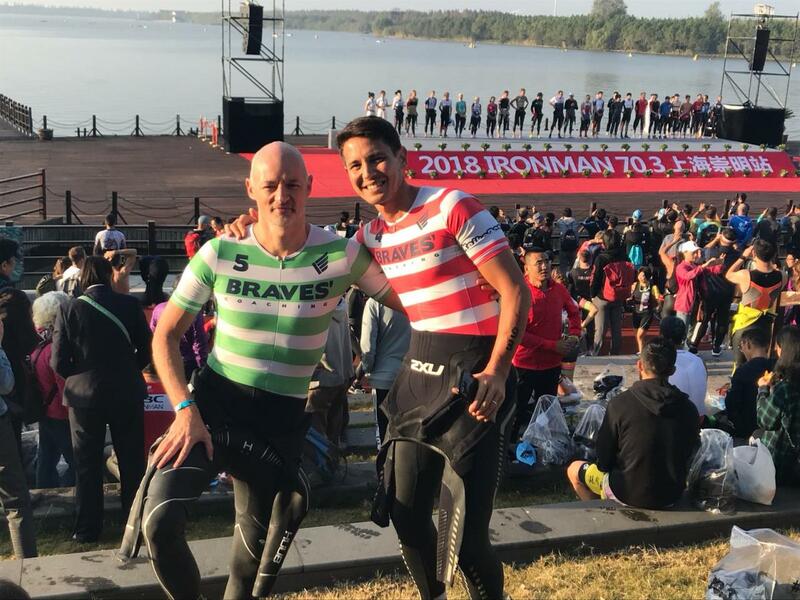 short background on work/ life/ sport etc etc / how did you come into tri? 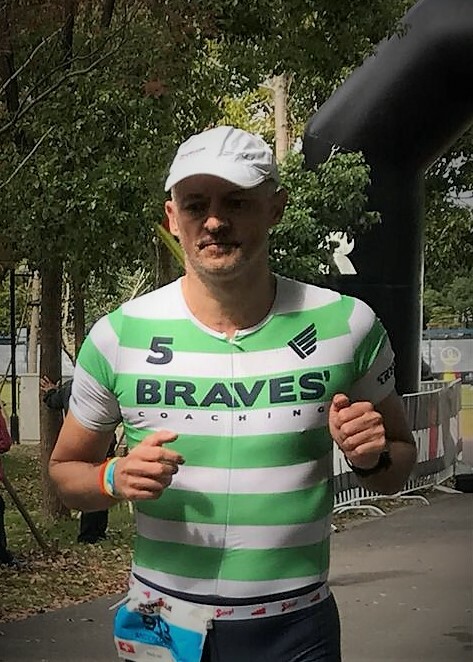 I am 47 years old, Swiss, married to a sporty wife, who fortunately fully supports me in my triathlon endeavors and together we have three beautiful children, Valentina, Raffaella and Nicholas. We have been living in Singapore for over 10 years now. Being self-employed gives me the luxury of more flexible work hours, which is helpful when executing such a time-consuming hobby like triathlon. In my younger years I was a passionate soccer player. Triathlon 1st came up 15 years ago in Zurich where I heard about the next Ironman race on the radio and decided to try it out on the spot. I did triathlon for roughly three years until we moved to Hong Kong, where work load and circumstances where too hostile to continue. I stopped for 10 years and only picked it up again one year ago (2017). Life, work and family had stabilized and I was keen to to re-activate my triathlon career. I realized that that the passion has not disappeared. What do you like about triathlon, what keeps bringing you back for more. I like the combination of three significantly different disciplines and the fascination of the mental battle over its own body during such a race ! The intensity during a race and those internal conversations and ultimately the satisfaction when crossing the finish line are deep experiences in my view that are hard to describe in words. Tell us abit about the journey - the ups and downs of good and bad race experiences, training with the squad compared to training alone. One definitely needs to accept that this sport is not a straight line up, no matter how much you put into it. One will always have to deal with set-backs. Especially at my age, working-out smart is more important than just adding endless volume, because with age comes the need for more recovery. I personally had a significant set-back a couple of years ago, when I woke up in the emergency room, from a half-marathon here in Singapore. I was totally dehydrated and the body overheated. Up to that day I always believed I can push my body as much as I want, the more shocking it was that something like that could have happened to me without sensing the warning signals. The damage of this incident was much more mental than physical, as I completely lost my confidence in listening to my body. So, I had to go through a few races, where I simply gave up and didn’t finish because I was not able to suffer, my will was gone. This is why my recent successful race in Shanghai means so much to me, because I managed to win the mental fight and crossed the finish line, knowing that I gave all I had on that day! And that is why we do all that, for exactly this feeling. As for squad training vs training alone: For me the right way is a mix of both. When I have a clearly structured set planned, I quite like solitude and focus, to also simulate a race day situation. But joining a squad training helps to push you more than you normally would being alone and it is also fun to see the other athletes and encouraging to train harder in order to catch up with the best. Being part of a squad is motivating, also when you travel to races. Seeing others, wearing the same colors is motivating for sure ! How did you feel crossing the line under 5hrs. Even though I constantly checked my watch during the run and therefore knew that I was on course to go sub 5 hours, I did not immediately realize it, crossing the line, as I was simply too exhausted and more focused of finding the next best chair. It took a moment until I truly realized what I accomplished. Briefly talk us through the race. High/ low points during the race. Standout thoughts at certain points in the race. After finishing the dinner I felt really tired and was convinced that I would fall asleep quickly. Lying in bed I was trying to visualize the race, picturing how I would cross the finish line and other positive thoughts. Those thoughts were great but they also made my heart race again, so I could ditch my plan for an early night but instead was lying wide awake and getting nervous. Eventually I fell asleep until 4.30am in the morning, race day ! First double shot of coffee for a week, pushed me up and I felt ready to give it all. The swim felt really good and I had the impression that I was going really hard and fast, even though I realized that I went off-course a few times. The more disappointing it was when I came out of the water to see that I was almost 4-5 minutes behind my ideal plan. That was clearly unexpected but knowing that I can power hard on the bike, I told myself to remain calm and make some time up with a great bike ride. 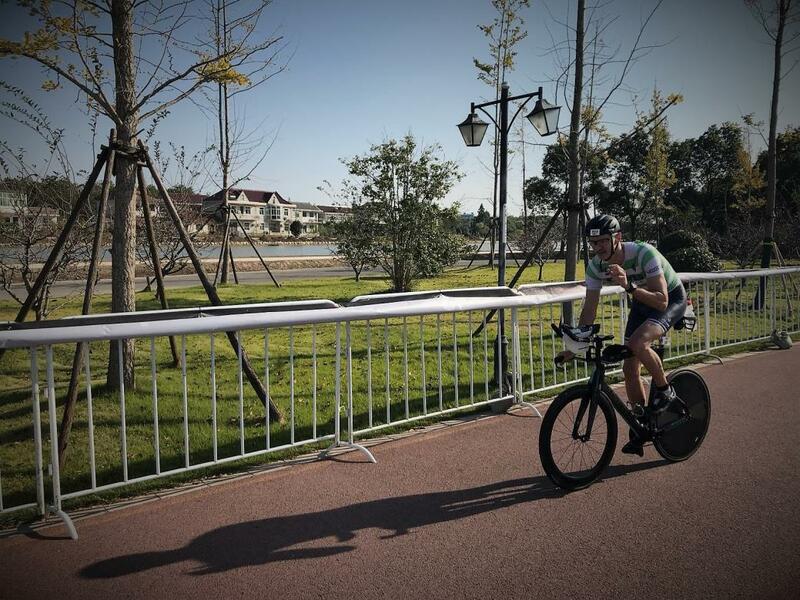 The first 5-10km on the bike were a struggle as I was breathing hard and could not push the way I was used to in the weeks before, which created some first negative thoughts because it felt that also the bike would end-up being a disappointment. With easing heart-rate I started to find into a rhythm though and from there I could finally start to push it harder. Halfway through the bike course, I knew that this could in fact become a hell of a ride and I even started to feel better the longer the bike ride lasted. I was clearly back in the race and even ahead of plan going into the run! What a tailwind. The run, being my weakest of the three, is always a big question mark and mentally a bit tricky for me. But this time, I found a pace that I managed to hold till the end and most importantly I had the will and necessary positive thoughts that kept me going, even when the body started to scream to stop this non-sense. How did the BRAVES' coaching experience prepare you for the race? The guided and structured coaching of Shem helped me a great deal ! Being a family man and entrepreneur I can’t afford to mess around with my available time. That is why an individually tailored, well-structured plan is absolutely a key ingredient for success. I also think the high-intensity sessions helped to prepare me mentally for what is coming on race day. I think one can learn to suffer, at least to some degree. But also analyzing my previous races and detecting the areas of improvement were important milestones to make it work this time. I always neglected nutrition in the past and this was another element I could improve with professional guidance from a coach. Any mental hurdles that had to be overcome? Please share with us the 2 most important 'take home' messages that you have learnt about endurance training and racing that everyone needs to hear. 1. nothing comes for free in this sport. You need to earn your awards by putting in the respective efforts! 2. Our minds are stronger than we think. I always stress the importance of communication in the coach -athlete relationship. Your thoughts on this please. I totally agree! This is exactly why I prefer to have a local coach, that actually sees who I am and how I train, how I run or swim over some overseas professional that only bases his assessment on pure data from an athlete. Any 'life lessons' you've picked up along the way? The lesson is an ongoing one, as such intense races are extreme ways to learn more about yourself and how you handle difficult situations in a given moment. The moment you think you know it all you probably have lost… But also the preparation for a race is a life lesson, as it requires so much discipline. In doing so, I also hope to inspire my kids and to be a good role model for them. What are the benefits of having a coach? The difference having a coach has made, compared to if you were to do this alone.. What are the characteristics for a good coach to look out for? No matter how much you know about the sport I think it is always beneficial to have that outside observation and less biased view. And for me it is also more efficient, as I don’t need to spend time to think how exactly I need to structure my training. A good coach is able to listen to his athletes and get to know them with all strengths and weaknesses. Only then a real tailoring of training is effective I would assume. I first want to digest this positive experience and take it easier for a few weeks and then discuss the plan for 2019 with my coach! Having missed a slot for the worlds’ by only 3 minutes, obviously created a readjustment of targets ! Now, I want it all ! Think you can go quicker... ? I can definitely go quicker ! Ultimately it depends on what somebody wants to achieve and how much he is prepared to sacrifice for that ! As I said earlier on, nothing comes for free in triathlon. For me personally, I am convinced that I still have a lot of room on the run ! And maybe on the bike and not to forget the swim . So you will stay busy for a while with me Shem.